Mary Keene, the founder of Cypress Grove Chevre, is a pioneer and recognized leader in artisanal cheese making in the U.S. Her innovative range of fresh, aged and ripened cheeses are nationally and internationally awarded for excellence. It started way back, in 1970s when Mary wanted a source of healthful milk for her children and she began raising Alpine goats. Her herd began winning numerous awards and while her goat stock continued to improve and grow, she was faced with an unexpected surplus milk; Mary made her first steps in cheese making. From the very beginning Mary strove to make the highest quality, and best-tasting artisanal cheeses, but market acceptance was slow. It took quite a few years before consumers developed a palate for the smooth, delicate flavors of Cypress Grove cheeses. Mary used this period of slow, steady growth to take special care of her customers and to work in conjunction with other goat cheese pioneers to develop the American market. Patience, hard-work and a commitment to quality paid off and over time, a large, loyal following began to seek out the Cypress Grove label. Today, renowned for its innovative range of fresh, aged and ripened cheeses and internationally awarded for excellence, Cypress Grove is a leader in the domestic goat cheese market. This Mini Truffle Tremor is the same wonderful delicate cheese as the traditional Truffle Tremor, just made in a smaller wheel of approximately 15 oz. A great choice if you have a party; this cheese would be a killer center piece. A bloomy white velvety rind that covers a delicate goat's milk cheese that has tiny little pieces of black truffle (Tuber aestivum Vittadini). The flavor is unmistakably earthy, coming from the truffles, and tangy with a crumbly feeling on your tongue from the goats' milk. Just a perfect combination. Once the cheese is cut the layer immediately under the rind will start to ooze, inviting you to dig in. 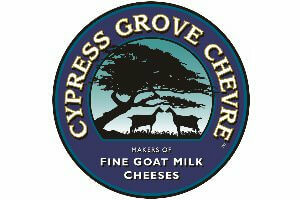 Cypress Grove received many awards with their Truffle Tremor; too many to list them all - among the Best of Show, Gold, Silver and Bronze awards; the latest were a 2nd place at the 2015 American Cheese Society Competition and a Silver award at the 2015 California State Fair Competition. If you would like to buy a larger wheel of approximately 3 pounds, please contact us by email or phone.